Crowdsolving is not a new concept. In 1714 this approach was successfully used to find a way (out of more than 100 submissions) to determine longitude at sea. Today, the European Union defines it as something that ‘enables individuals and organisations to engage crowds to submit, discuss, refine and rank ideas and submission in relation to a specific question or problem’. Crowdsourcing of designs is also not new; architectural competitions have existed for the longest time. From Bruneleschi’s 15th century dome of the cathedral in Florence and Paxton’s 1851 Chrystal Pallace in London to some today’s most innovative projects, competitions have always been the opportunity to generate new ideas, advance the field of architecture and make our world a better place. Traditional procurement methods for architecture are not always the most successful. Organizations usually rely on a limited list of companies that they think can do the work, resulting in high-cost contracts with very limited design choices created over a long time period for the client. At Build Academy, we offer an alternative process to for finding the best design solutions for any project in the built environment. We have created a community of practice of over 20,000 building professionals from over 160 countries who apply their skills by participating and collaborating in our crowdsolving design challenges. With each challenge, we expand our community with targeted marketing campaigns and partnerships with institutions. 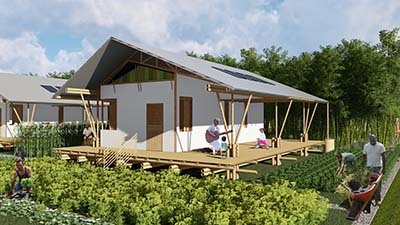 In our latest crowdsolving challenge for Resilient Homes we partnership with the World Bank, AirBnB, GFDRR and UN-Habitat we asked for designs for areas vulnerable to natural disasters. By the end of the challenge, we had 3225 participants and received over 300 quality designs from over 160 countries in just 3 months. Rather than only involving a small consultant team whose composition is limited to the size of the company, Build Academy’s crowdsolving clients and have access to a community of thousands of professionals who can form teams flexibly on a need- and topic-basis. Moreover, in traditional procurement, competing companies usually don’t exchange information; the flow of information and potential resulting learning and ideas is blocked. In crowdsolving meanwhile, specifically at Build Academy, an exchange of ideas and feedback as well as discussion of case studies is supported and actively encouraged among all participants. Crowdsolving also has a number of non-design related benefits. Since it involves a global call that is marketed to architects and engineers from all over the world, rather than being a silent call for proposals among a small list of potential contractors, it also results in immense brand exposure and marketing for the challenge partners. Our latest campaign reached over 600,000 people. Lastly, sourcing solutions from a global community rather than locally is becoming imperative for a number of countries. The importance of leveraging local knowledge in faraway countries for increasingly global, culturally sensitive projects aside, some of the countries with the fastest growth and largest populations have the least access to professionals. For example, in China there is one architect for every 10,000 people and in Italy one per 400. Interestingly, Italy is one of the countries where currently you have the least amount of new construction and China currently has more than 50% of the construction in the world. Global crowdsolving challenges also mean that architects in oversaturated countries like Italy get an opportunity to still apply their talent – just in another country. We got inspired to give crowdsolving a try when typhoon Haiyan hit the Philippines in November 2013. Unfortunately, more than 6,000 people lost their lives and more than 1 million homes were destroyed. We wanted to help, and put out a call for help to our community of architects and engineers to participate in a Resilient Schools Design Challenge. We prioritized schools because they stabilize the day to day routines of children after such traumatic events, act as community centers in the evenings and can be used as shelter during the night by those who lost their homes. We had significant interest: over 4,200 people signed up and by the end of the challenge we received 87 submissions. It was both a shock and a bit of a revelation. Lots of people around the globe were inspired by our initiative. Architects, civil engineers, designers, social workers, consultants and others were putting forward their time and creative energy to help us find a solution. The Philippine Department of Education and local NGOs quickly signalled interest in the designs, and invited us to exhibit and publish the projects. Ultimately, the designs served as a reference to local architects and school principals to build back better. As of today, we have successfully run 7 crowdsolving challenges for public and private sector clients, including one product design challenge for the NGO Liter of Light. Topics ranged from emergency shelters, to solar lights. It has also become our main line of work at Build Academy. Needless to say the quality of solutions generated by a global community of crowdsolvers far exceeds what is possible for one organization going it alone. To us, this demonstrates the opportunity he have to build community around shared challenges by using the power of the Internet. It proves that we can solve problems together — no matter where we are on this planet. 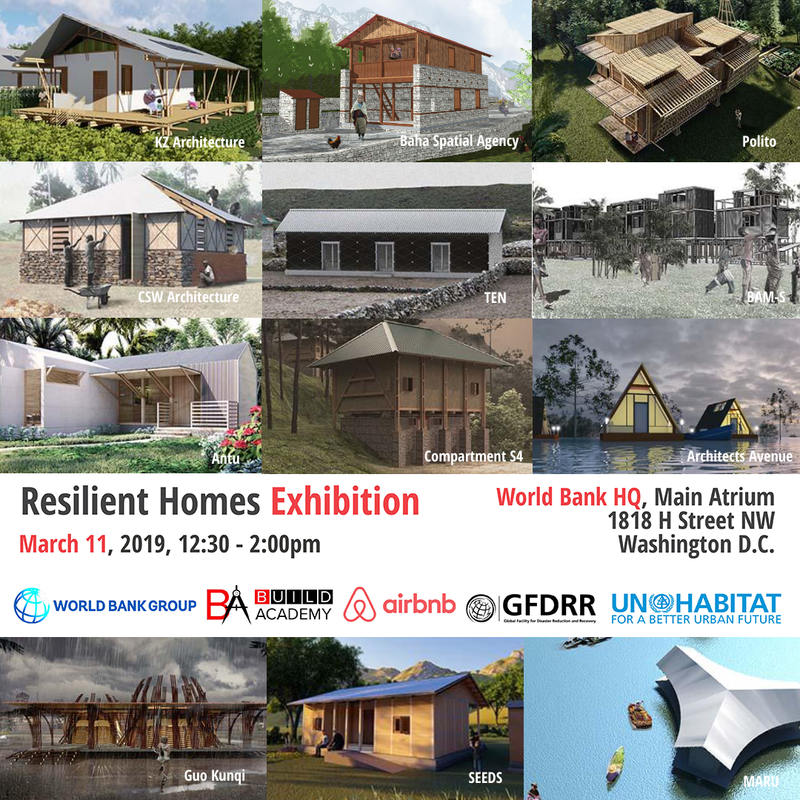 Our most recent initiative was the Resilient Homes Design Challenge, which we ran in the fall of 2018 in partnership with the World Bank, GFDRR, AirBnB, and UN-Habitat. To ensure a truly global reach, we activated our online community of over 20,000 architects and engineers and ran a global marketing campaign that had a reach of over 600,000. We ended up having over 11,000 monthly unique visitors on the challenge website, a total of 3,225 registrations by professionals from 160+ countries, and ultimately received high quality final submissions by more than 300 teams. The jury was impressed by the quality of the submissions as well as the diversity of materials and construction approaches, the latter ranging from traditional construction to flat-packing, 3D-printing and more. We have developed a complete model for supporting and engaging participants throughout the entire challenge, in order to ensure the best possible exchange between the participants and results. This goes beyond just creating the challenge website, activate our community, manage the marketing & PR of the challenge, and evaluate the final submissions. Are you Iinterested in a Crowdsolving your project? If you are interested in learning more about our crowdsolving challenges, simply fill this form of interest or contact us at info@buildacademy.com. We will get back to you soon to set a time and day to discuss the exact problem you are looking to solve, what your desired output of the challenge is and the way you would like to structure the challenge. Build Academy is the leading company specialized in crowdsolving for the built environment. Our community of over 20,000 professional architects and engineers from 160+ countries is ready to tackle the toughest challenges in the built environment.